We commit to quality in all stages of our production and business operations. Your benefit is our goal! 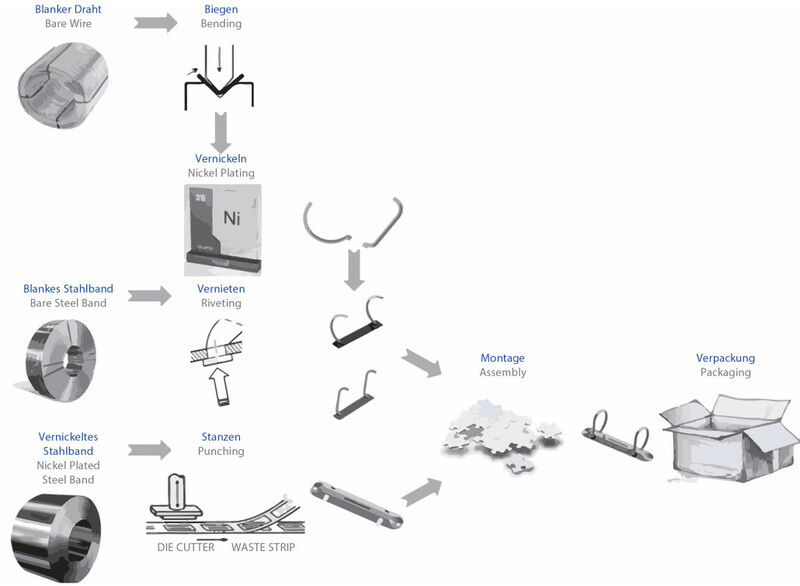 There are only a few specialist companies throughout the world which master the production of ring binder mechanisms. With our manufacturing site Koloman Handler in Oroszlány, Hungary, we are the biggest manufacturer of ring binder mechanisms in Europe and process more than 5,000 tons of wire and steel. Quality starts already with the choice of raw materials. We use raw materials from renowned European steel suppliers. The processing is carried out taking into consideration minimum tolerances, by using state-of-the-art assembly machines. An in-process quality check takes care of the compliance with all parameters. We stand for maximum delivery reliability and punctuality. All our employees, without exception, are committed to the satisfaction of our clients. Your satisfaction is our driving force to give our best every day. A dedication that is been counted on by many of our customers for decades. And justifiably so. Ring Alliance sets standards also in the area of environmental management. Thus, no pollutants damage the environment: Our quality is sustainable!